When we introduce LEGO to a group of participants, about 90% grab for the kits as soon as they hit the table, throw one open and get to work. It’s remarkable to watch, really. They just can’t keep their hands off the stuff. Like kids in a … LEGO store? The other 10% are what we call ‘The Hesitant Few”. These folks may have one or two things going on : they are unfamiliar with LEGO and uncomfortable trying it, or they don’t believe LEGO will help them achieve their objectives. In either case, “The Hesitant Few” generally sit back initially but do join in once the rest of their tablemates have started building, laughing and engaging in useful conversation. At an event recently, we had a whole table of hesitators. While the other groups started building LEGO models in the centre of their tables, this table decided to use dialogue and pen and paper to complete the task at hand. After all, paper has always worked in the past, and what is this LEGO stuff anyway? For three or four minutes they discussed the task and threw ideas back and forth about what process might work for their group. One person started making a list. The six group members talked passionately, disucssing the issues and exploring various topics. There was a sense that they had been given a difficult task, and there was some uncertainty about how to proceed. As the conversation continued, someone put a single brick on a base plate and started gesturing to it, referring to it as a part of the solution. For the next three minutes people continued to discuss the issue, often pointing to the one brick in the centre of the table. Before long, someone put a second brick beside the first to represent another part of the solution. More talking. More pointing. It took another 5 minutes and another 13 individual pieces of LEGO, representing 13 other pieces of the solution before the group decided that this ‘LEGO model thing’ might just work after all. … which, in case you can’t tell, is a detailed model of completely redesigned Health System. They may have joined the party at their own pace, but once they arrived they certainly didn’t hold back. 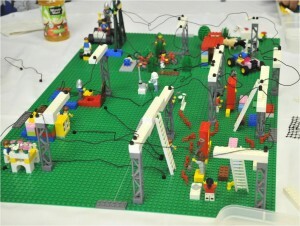 And that is why we love to use LEGO with our clients. Not just because of the 90% who jump at the chance to dig their fingers into piles of colourful blocks (although they are fun too), but also because every time we pull it out, we get to watch”The Hesitant Few” – those skeptical 10% – achieve more, faster than they would have otherwise been able to. And what’s more – they laugh heartily while watch they watch the details of their ideas taking shape in front of them.